Duck Baker & Jamie Findlay met in 1995 in Edenkoben, a small town in southwestern Germany. 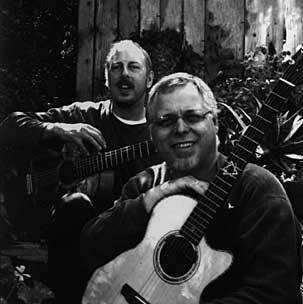 The occasion was a festival devoted to American fingerstyle guitar music which was curated by Peter Finger, the aptly-named German guitarist whose Acoustic Music label has put out records by many American players, including Duck, Jamie, and Woody Mann. After lining up these three for the festival, Peter added Jerry Ricks to represent the acoustic blues styles and Thom Bresh as the delegate for country. By all accounts it was quite a weekend; though most of the guitarists had never met they performed in a variety of duo and trio settings, and Duck, Jamie, and Woody have all kept performing together over the years since. Since Duck and Jamie are both based in California, they’ve had more time to work together, and it’s amazing to hear how far the duo has progressed since getting “serious” about it a couple of years ago. I’m handling the term “serious” with gloves because even though the arrangements reflect many hours of work and many performances, humor is one of the qualities most evident in the music. Most guitar duos are basically a matter of one guy playing lead while the other plays back-up, and this is generally how Duck and Jamie operate when they solo, but the arrangements are a different matter. Since both players are fingerstylists, the heads can be arranged with melody plus a bass line and up to two more harmony parts, a radical departure from even George Van Eps-style guitar thinking. Indeed it would have to be a departure, because Duck and Jamie have extremely different backgrounds and approaches to the instrument. Jamie Findlay is simply one of the best contemporary acoustic jazz players in the world, master of a virtuosic style that is often compared to Ralph Towner and Pat Metheny. He has studied with such giants of modern jazz guitar as Lennie Breau, Joe Pass, and Ted Greene, and is a familiar figure on the Southern California scene. His solo guitar recordings have been well received both at home and abroad. In the late 80’s he formed the Ford-Mock Findlay Trio with Don Mock and Robben Ford, which was much in demand during the year or two they were together. Currently, he is a member of The Acoustic Jazz Quartet, an excellent L.A. based aggregate who in 1999 made an exceptional record for the Naxos label featuring some fine Findlay originals. The follow-up is slated for later this year. In addition to his solo career, regular and occasional band work, and duo tours with guitarists like Duck and Woody, Jamie is highly sought after by vocalists who value his sensitive work as an accompanist. He also maintains a busy teaching schedule, having published numerous instructional books and videos, and he regularly contributes columns to guitar magazines. One of the most highly regarded acoustic fingerstylists of his generation, Duck Baker is best known for his work in the traditional folk, ragtime, and swing worlds. Duck has been compared by Chet Atkins to Jerry Reed, but his thinking runs more towards jazz than either of these country giants. He has been a dedicated student of the music and its history since falling in love with Thelonious Monk and John Coltrane records in the mid-60’s. It’s interesting to note that, while Duck’s name is new to the pages of jazz journals as a player, he has contributed to them as a writer for over three decades. Duck’s interest in all forms of American music from its Irish and Scottish antecedents to free improvisation has been likened to classical musicians who perform repertoire from all periods from renaissance to modern music. Duck was involved in the free music scene in New York in the 70’s, though the only record of this is one side on a Eugene Chadbourne LP. Nearly twenty years later John Zorn asked Duck if he would like to make a record of tunes written by the great pianist, Herbie Nichols, and the result was the highly acclaimed “Spinning Song”. Baker credits this project with helping him to adopt his style to the modern jazz idiom. Because they were specifically interested in exploring the possibilities of arranging jazz tunes for two fingerstyle guitars, Duck and Jamie decided to focus on tunes written by great jazz composers rather than original tunes or standards. The only exception on the program here is the chestnut, ‘All of Me”, which they often use to get in the swing of things. Most of the material is familiar to even casual fans, which actually serves to underline how different the approach is. But as interesting as all of this may he, the important thing is that when these hoys hit, they swing in a way that many contemporary players seem to have forgotten about, and they play off each other beautifully. A lot of what’s best ahout this duo is stuff that just happens, and even the arrangements leave room for the interplay crucial for the music to come to life. It’s a gas to see these guys because they never seem to stop grinning while they’re playing, and that joy comes through on the record. Check out the lift when Jamie rakes over the lead and Duck puts down a bass line on “A Train”, or note the smooth transition from one soloist to the other on Oscar Pettiford’s tried-and-true blues line, “Collard Greens and Black-Eyed Peas”. For breath-taking pyrotechnics, try Jamie’s solo on Fats Waller’s “Jitterbug Waltz”. For humor, listen to Duck on Horace Silver’s “The Jody Grind” (the title is a military term for adultery, and Duck seems to he saying that they’ve got military bases in middle east, too). Better yet, listen to both players romp their way through Monk’s “Well, You Needn’t”. Everything but the kitchen sink goes into this live performance. As a solo piece, Jamie serves up a stunning version of Clifford Brown’s “Joy Spring”, a masterpiece of advanced harmonic thinking that will leave guitar fans gasping for breath. 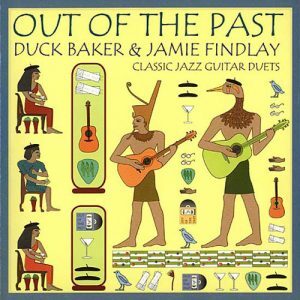 Duck contributes a neglected Benny Golson number, “Out of the Past” , and a version of Jelly Roll Morton’s “Wolverine Blues” that shows his folk-ragtime roots. The chords that begin the trio section remind this listener that our music’s first great composer played the guitar hefore taking up piano. These solos demonstrate both the differences in approach and how far both players have developed their individual styles. But the duo allows room for the two to engage in all kinds of creative dialogue, mind-reading, second-guessing, and tomfoolery. This is guitar jazz that’s not just for guitarists and not even just for jazzheads. 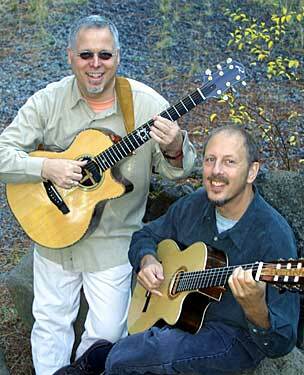 There’s an immediacy about this duo that will set almost anybody’s toes tapping. Recorded by Jim Nunally in Crockett, CA., except track 6 recorded at BPM Productions in L.A., CA, Eddie Roscetti, engineer, and track 12 recorded LIVE at the Espresso Garden in San Jose, CA, using a SONY mini-disc recorder. Mixed and mastered by Jim Numally at Crockett, CA. Recorded April, 2001, except tracks 3, 6, 9; recorded August, 2001, and track 12 recorded March 16, 2001. All songs arranged by Duck Baker and Jamie Findlay.